I never venture out to see the non-stop offering of multi-starrer comedy film churn out by the untiring Hindi Mainstream Cinema machine, be it all about Money, College girl with rich father, Lottery ticket reaching a village or guys acting as blind, dumb or deaf or being plainly confused about their sexuality. There is one of such films every second week heavy with dialogue, mostly driven by no-brainer characters but the bottomline being trying very hard to be comic, there is an absolute dearth of situational comedies, even giants like Om Puri, Paresh Rawal just act in almost everyone due to lack of serious work. 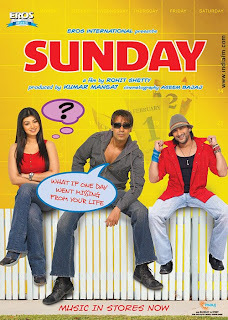 Sunday is truly an exception, a fresh offering from Rohit Shetty, his earlier offering was Golmal, I wasn't quite impressed by it, but Sunday is definitely a welcome change. A realistic scenario, moreover the film is based around a girl and the harmful effects of date drugs, at least some attempts on making a social statement. The film's story revolves around a young bubbly, dubbing artiste Ayesha (Saher), who parties one night with major repercussions. The characters in the film are well crafted, and Ayesha's future definitely looks bright. The film is broken apart like a jigsaw puzzle and you are tossed around the narrative trying to piece the film together. Well, that is a lovely piece of work, something never normally seen in a Hindi Mainstream film. Most of the efforts in these films goes behind piecing flop actors spewing gimmicky of dialogues to raise the humor quotient. But here, the viewers have to do some serious stitching job to understand what exactly happened on that night. Arshad Warsi and Irfan Khan are great relief in the film, most of their interludes are shot in real locations in Delhi and they almost work like narrators of the film. Through them, and their confused state we start the film, as we start understanding on to what happened on that night, their involvement in the film also grows exponentially. They have made the most out of whatever screen time they got in the film, and this clearly shows their acting prowess. Although there is some creative license where one’s credibility meter is stretched. Picture this: a red ambassador cruising down the lanes of Delhi, passing of for a cab. To top it, this is one cab which is never empty. Arshad's cab always has his chum, the wannabe actor sitting at the back, and he is still picking up customers. What makes Arshad's character endearing and comical is the fact that he is a serious guy in the movie trying to make his living and pay for his kidney operation. But it is what he does, how he does it and what he says that makes him a funny character in the movie. Ajay Devgan, as usual has his share of brilliance in the film, and it will take time for Ayesha to equal up to him. The film has no major flaws and the comic timings are just right. Great Climax ending all the confusion. Inspired from Telugu hit Anukokunda Oka Roju, this movie is a mystery revolving around a murder on a night of Sunday. A girl named Seher (Ayesha Takiya) who’s a dubbing artist is a simple girl, one day she decides to have a night out, but on that particular night few incident occurred which cause trouble to our sweet and charming Seher. She is actually little forgetful in nature and this all creates trouble, then comes Mr.
who thinks that she is trouble for them because of that Sunday. Morever, we have Arshand Warsi (He is cab driver, actually gave was hired on that sunday) comes up , along with Irfan Khan now and then and makes some nuisanse. It could be solved easily of our COP can find all about that missing Sunday of Seher (Ayesha).